The Trek 8.6 DS ia an interesting blend of ideals both on the road and off - It's competent and comfortable in most scenarios but with some compromises. In a sometimes confusingly categorised bike market where the hybrid tag can encompass all manner of on and off road sub groupings, this jack of all trades comes close to being the master of compromise. You can read both positives and negatives into that. Surprisingly fast on both blacktop and trail, it's difficult to find fault with if you're looking for a comfortably casual all-rounder. But we uncovered a few niggles. Trek DS (Dual Sport) bikes are described as 'the ultimate hybrid: part refined city bike, part adventurous trail ride.' The £400 8.1 entry model of six bikes in the range has a rigid frame and fork, which in most respects is what we'd see as a plain and practical hybrid. 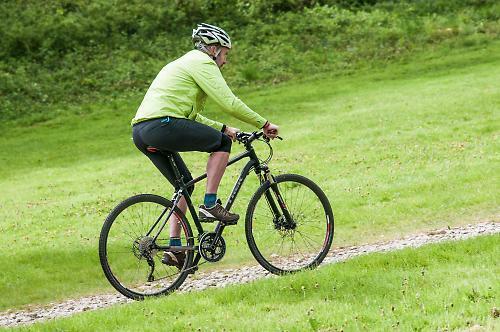 Other models in the range, climbing in price by around £100 at a time, are equipped with suspension forks, rising all the way up to our test bike, which comes with a small amount of rear suspension built subtly into the seat stays. A 'Gary Fisher Collection' logo on the seat tube is a reminder that this one of the small collection of Trek bikes that owe influence to one of the founding fathers of mountain biking. Fisher spends much of his time these days promoting the bicycle as a simply logical means of transport, but he was also very influential in the popularity of 700c wheels on MTBs. 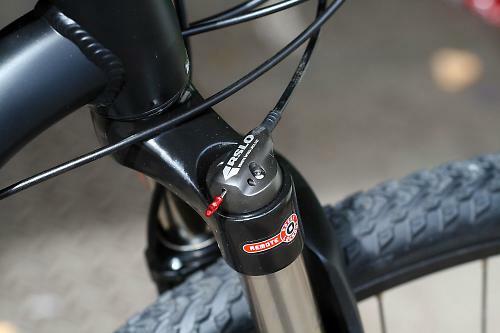 The 8.6 DS is essentially a 700c suburban hybrid with 30 gears, a fairly basic SR Suntour 63mm travel suspension fork, 20mm of almost invisible elastomer damped suspension out back and hydraulic disc brakes. Tipping our scales at 27.8lb (without pedals) the 8.6 is a reasonable weight if you're comparing it to other off road bikes with suspension - but heavy if you're comparing it to £1000 road-biased hybrids without suspension. And that's where compromises enter the equation. What's good for the goose isn't necessarily good for the gander. While there'll obviously be riders whose priority will be less weight rather than the enhanced comfort or shock absorption of the fork and IsoZone seat stays, we were impressed by the way the suspension could be completely ignored until it was needed. 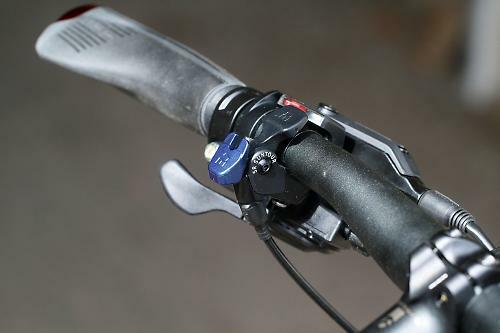 The fork has a bar mounted lockout lever for smooth road riding and the back end simply takes the sting out of rough roads and bumpy trails without any obvious downside in pedal power transfer or wheel tracking. It's a design that reminds us of the softtail mountain bikes (and Paris Roubaix specials) Trek offered many years ago, but it's also a reflection of what they're doing with the vibration damping Domane road models. The upper seat stays are designed to float on elastomer bumpers that sit between the stays and a capped wishbone top. The design only features on this bike and the £850 8.5. In use it does a fine job of softening the back end, even on rough trails, but a rattle that developed during the first ride turned out to be loose screws on the top crown. We tightened it but a few rides later the crown loosened again and fell off. The crown is a finishing touch rather than an structural part of the rear suspension set up but it obviously needs to be more securely attached. Front end comfort is certainly enhanced by the suspension fork, but it's not a fork that's up to the rigours of intense off road riding. To be fair, it's not really supposed to be, but we couldn't resist looking for its limits. Its main limitation is a clunky rebound on bigger bumps. It's fine for rough roads and easy trails. 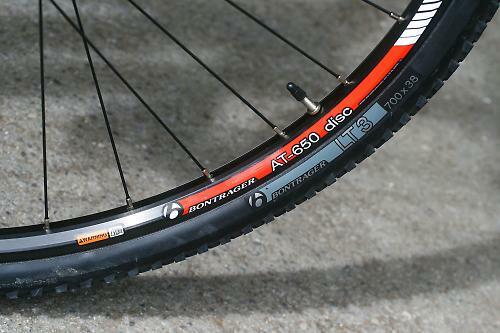 Still on the topic of comfort, we were really impressed with the Bontrager LT3 tyres. Their high profile 38mm width obviously adds comfort when the going gets rough, a centre strip maintains speed on the road and the cyclo cross style side treads offer decent traction in tough trail conditions. 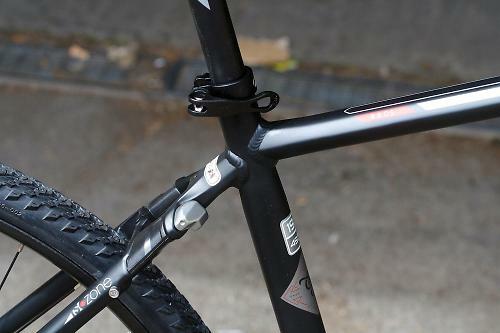 The Alpha Aluminium frame and the fork have eyelets for mudguards, but not all 'guard stays will suit the threaded bosses part way up the fork legs. There are two sets of bottle bosses (over and under the down tube) and a luggage rack is relatively easy to fit, with the disc brake calliper tucked out of the way between the seat and chain stay. The rack eyelets are a long way down the seat stays though, so not all racks will fit. There's also loads of clearance for much bigger 29er MTB tyres if you feel attracted to more challenging terrain. 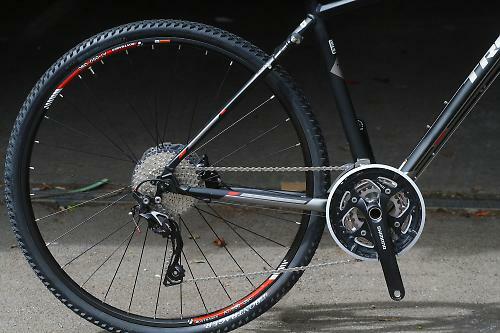 The Bontrager AT-650 rimmed wheels are fitted to a few Trek MTBs too... and yes, those rims are called 650, but they're not 650b, they're 700c. The hubs are from Shimano, with centre-lock-rings for the discs: these are the same as Shimano cassette lock-rings. Braking was superb throughout the test period. The build kit on the 8.6 is well suited to riders who like to take in a fair amount of riding on rough back-roads and trails. In fact the state of our local blacktop routes is starting to make suspension look increasingly attractive as an urban option too. 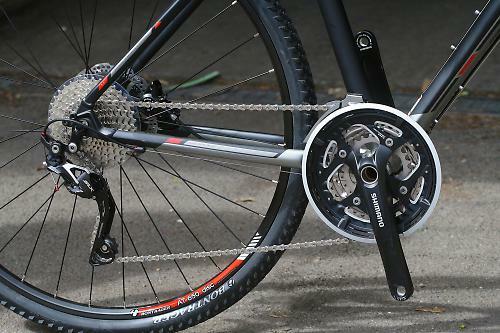 Shimano hydraulic disc brakes have a reputation for reliability, as does the Shimano SLX based 3 x 10 drivetrain, which probably has a wider range of gears than most of this bike's buyers will need. 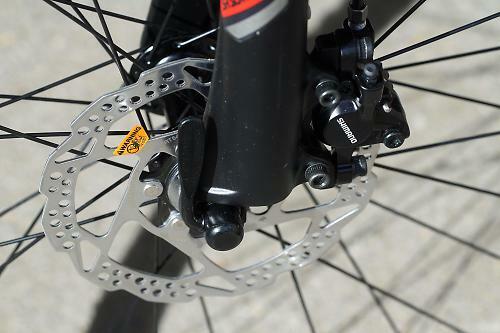 The 11-36 cassette ensures that the 26 granny ring up front rarely gets used. In fact, neither does the 48. The 36 middle ring deals with almost everything. The rest of the finish kit is decent quality Bontrager branded stuff (saddle, seat post, 62cm low rise handlebar, comfy ergonomic grips and stem) and there's plenty of bar height adjustment potential built into the steerer. Urban riders might appreciate the trouser guard on the crankset: if you don't you can remove it. 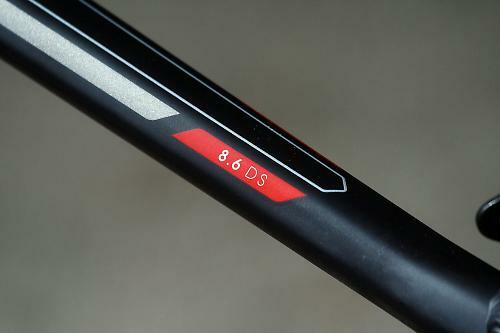 The 8.6 has a confident but fairly lively handling feel on the road, unsurprising really as the frame geometry (on the 19.5in bike) is 73.5 degrees at the seat and 72 degrees at the head. Off road handling gets nervous when the going gets rough and the fork starts diving over bumps, but it's manageable as long as you don't turn the steering too sharply at the same time. A sloping top tube offers plenty of standover clearance and a long (605mm on our 19.5in test bike) horizontal reach, but a fairly high and very adjustable bar and stem position makes for a relaxed sitting posture with enough reach to stretch out and really put your back into it on the climbs. Many hybrid type bikes feel too cramped for hard and fast riding. The 8.6 nicely combines comfort with a lot of potential for speed. As well as its obvious commuting and on/off road flair, it would also moonlight as a very competent pannier equipped touring bike. Obviously there'll be plenty of riders who think a £1000 hybrid with suspension and disc brakes is overkill. If you're one of them, you may be better served by the £400 version, with no suspension and rim brakes: it may be lighter too, as well as £600 cheaper. But there'll also be riders who like the idea of getting as much bike as they can for £1000 while not really wanting or needing a purist mountain bike or a dropped bar road bike. The 8.6 might be for them. Competent and comfortable both on the road and off but with some compromises. Alpha Aluminium butted frame with 20mm of elastomer rear suspension, SR Suntour 63mm travel suspension fork. Trek's DS (Dual Sport) tag is pretty accurate, although if we were to be pedantic we'd argue that is more 'dual casual' than dual sport. Pushing it hard, on or off road, reveals its compromises. Generally decent build quality, but the suspension performance certainly isn't up to harsh off road use. 72 degrees at the head, 73.5 at the seat. Fairly long reach compared to many 19in hybrids. Adjustability potential for a high or low bar position. Very comfortable both on and off road, but the forks are not up to the quality of a £1000 MTB. A little bit of twist through the back end on bumpy corners but generally good. Yes. No power lag via rear suspension. How would you describe the steering? Was it lively, neutral or unresponsive? Lively, a little nervous when fork was compressing off road. Rear suspension surprisingly effective considering it's only 20mm. Tyres add to general comfort on the road and on gentle trails. Rear suspension gets a bit chattery when sprinting on rough terrain. 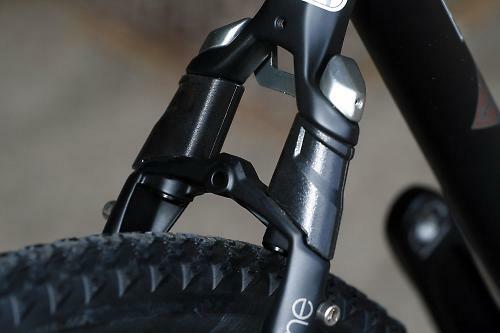 Suspension fork dives easily when descending on very bumpy ground. Fork lockout useful on climbs. With such a wide ratio cassette at the back most riders will spend most of the time in the middle ring. Tyres and suspension are both a boost to comfort. Superb mix of speed, traction and comfort in the tyres. Disappointed that the aluminium cap on the wishbone topped rear suspension kept loosening. It's aesthetic rather than structural, but it needs better fixing bolts. Would you consider buying the bike? Not at present. As discussed in the review it's a jack of all trades and a master of none in particular. Wow! Im really struggling to work out how this bike has scored 6/10! First of all lets look at what this bike is for. Its an all rounder, as you said yourself, a jack of all trades and a master of none. That is what it is marketed as. Its for the every day rider/commuter who fancies some soft trail riding at the weekends. You then seem to compare it to a road bike and then to a MTB?! and statements like "but the forks are not up to the quality of a £1000 MTB." Of course they're not, thats not what they are for. Im really confused by this review. You seem to get the point of the bike and then completely miss it at the end. Wario. At the risk of splitting hairs.. I said 'master of compromise', which is not quite the same as 'master of none'. "Anything further to say about the bike in conclusion? As discussed in the review it's a jack of all trades and a master of none in particular." Show me a sub £1000 hybrid that has decent mtb forks. You won't find them because that's not what they are built for. Hi Wario... fair cop. I remember thinking I didn't particularly want to use 'master of none' in the text because I knew it would be seen as negative. But I guess it applies to almost all hybrids really... not really ideal on the road or off but quite good at both. Read 'quite good' as 'master of compromise', which in my world relates roughly to a 60% score. Here's my point, would you mark down a Subaru forester because it didn't perform as well as the land rover off road or the Bugatti Veyron on it? Hi Steve, I see in your review you mention the trek DS should be able to take a bigger 29er MTB tyre. This would sway my decision on getting this model. Would you be able to suggest appropriate products of the mountain bike wheel/tyre size (wheel, tyre, disk brakes and crank set) if you can? Your advice and expertise would be much appreciated.